Doctor, office manager, lawyer, project manager, engineer, real estate mogul, PR shop. If you're in business—any business—the bigger you get, the more likely it is that tracking and managing documents is one of the biggest challenges you face. Enter CHL Software's DocMoto, a server-based application designed to manage every document your organization touches, from email messages to Office documents. It tracks changes, controls access, maintains revision histories, locks documents for editing, and guarantees that everything you do is centralized, organized, and easy to access. DocMoto's user interface behaves just like the Finder, only with an audit trail and excellent tools for managing which files are being edited. 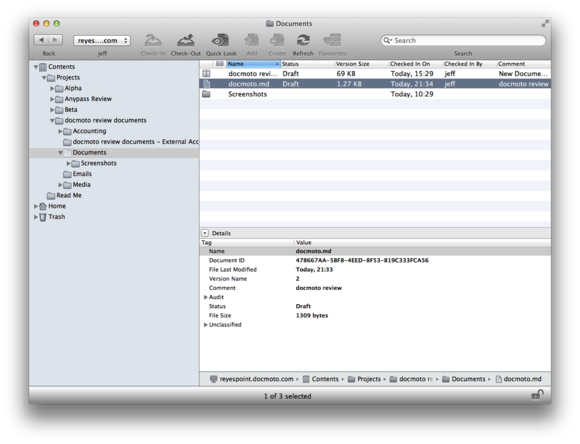 The DocoMoto user environment consists of a Finder-like interface that you use instead of your Mac's Finder for storing and managing your documents. In order to use the application you first have to have access to a DocMoto server and a user account set up for log in. DocMoto user accounts are a powerful tool you use to manage access to files and folders stored on your DocMoto server. There are several options for creating users, including DocMoto's built-in user database and integration with LDAP and Open/Active Directory servers. 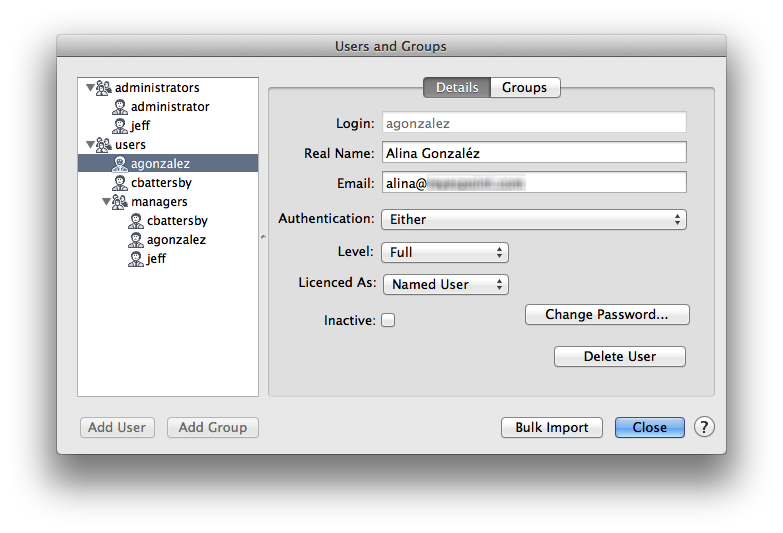 While user information comes from these databases, you manage user access using DocMoto's Users and Groups tool, which works in a similar fashion to most server-based file security tools. DocMoto's security features make it easy for you to manage which users and groups of users have access to files and folders. 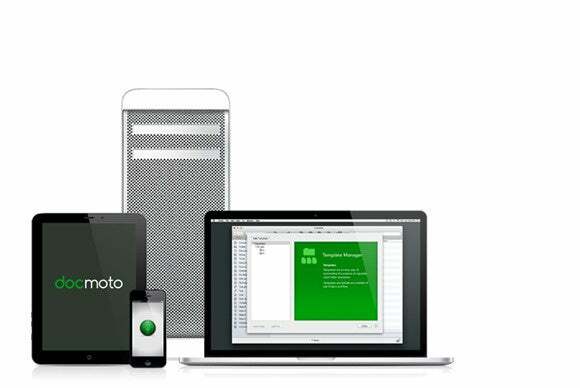 You access files stored in DocMoto the same way you work on any file in the Finder, with one notable difference: Double click a file in DocMoto and you will be asked whether you're opening the file for viewing or editing. Choosing view opens the file as a read-only document, choosing edit checks the document out to you and locks it for editing by anyone else. Other users can view the document, but no one can make changes until you check the document back in. There is really no limit to the types of files you can store using DocMoto. CHL Software states that they are yet to come across a file format they can't support. 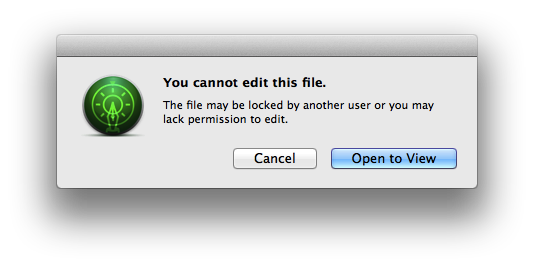 The only possible limitation is on the client side, where editing is dependent on having an application on your Mac that supports a particular file type. Double-clicking a document for editing opens that document in the appropriate application. When you're done with the document, you save it, close it, and check it back in. If you don't have an app capable of editing the document, Apple's Launch Services feature will attempt to guide you to an appropriate app on the App Store. When you're done editing a document, you close it and then check it in using the DocMoto app. As you check a document in, you can add tagging information to it, update comments, and provide other useful information that other users will be able to see. DocMoto keeps copies of all previous versions of the document and, if you're using Microsoft Office, allows you to compare different versions of the documents to see what changes have been made. DocMoto uses Office's Track Changes feature for the comparison, which is why this isn't available with other types of documents. Don't like the current version of a document? You can easily replace with a previous version. I was also curious about how well DocMoto would handle documents saved using Maverick's and Yosemite’s auto-save feature, and found that the app handled changes to auto-saved documents without issue. There are a number of ways to interact with documents in DocMoto. You can add new documents by dragging them from the Finder to DocMoto, you can email documents from within the app, or email links to users that allow them to access the documents externally and separate from the DocMoto environment. You can also set notifications on documents and folders so that you're notified whenever a document is modified or a file is added to a folder. In every instance, a detailed document history is maintained on the document and what's been done with it. Someone else editing a file? DocMoto keeps track and won't anyone make changes while someone else is working on a file. DocMoto also has a very useful feature called folder templating, which lets you automatically populate a new folder you create with subfolders and appropriate tags and permissions. This feature is extremely sophisticated and, yet, simple to use. You can create automated naming schemas and, if the way you want folders created changes, you can apply these templates retroactively to all folders previously created using an updated template. DocMoto also has a companion app for the iPad, which provides all of DocMoto’s features—check-in/check-out, document editing, change tracking, etc.—in an interface that works just like the desktop app. DocMoto is a powerful and sophisticated document management tool that allows you to track everything you do with any type of document. There is no other document management application I've seen that matches the features, intelligence, or capabilities you'll find in DocMoto. DocMoto is a powerful and sophisticated document management tool that allows you to track everything you do with any type of document.